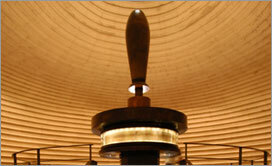 Website, text, and photos © The Israel Museum, Jerusalem, 2011 All rights reserved. Upper hall interior beneath the parabolic dome, in its center, the Isaiah A Scroll. Please note: currently the online translation is only available for the Isaiah Scroll.